"Price will go back to it's regular price shortly so don't wait"
Note: To draw more traffic, I periodically will post killer deals like this to promote my shop but it truly doesn't last. Often it's for just one item and is first come first serve, then it goes back to the regular price. Don't delay in thinking this might be around later because I get emails all the time asking if they can get the old sale price and I just don't do that. If you like what you see above, buy now and get it before the sale is gone and if you have any questions, don't hesitate to contact me here. Good luck and have a blessed day! The metal is titanium stainless steel finished in four primary finishes. Cut from Titanium and milled to perfection! Then I finish it with a gorgeous 24k Gold Plating, Stainless Steel Black, or Stainless Steel Silver Finish made to last! "Extremely Strong Space Metal / Very Light and Comfortable". Very Stylish and a great way to show your partner your devotion and love! The ring is designed for couples or anyone looking to replace their existing band. 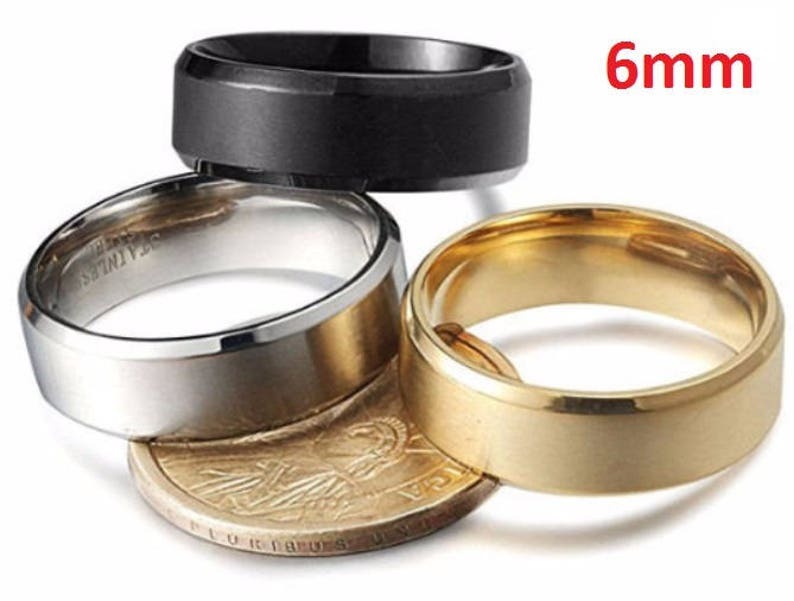 Perfect to wear at work so you don't damage your original ring set, for married couples, engagement rings, promise rings, replace lost or damaged original rings, Great for work to wear without worrying about ruining your original ring, etc. For a small fee, I can custom engrave something special on the ring (inside or outside of the ring) - Just PM me to discuss and get a quote. They are polished extremely well and like with all our rings are given a comfort fit polishing, so you needn't worry about it hurting your finger while working or when wearing for long term. Just choose what size fits you best and if you are uncertain, please be sure to get a fitting from a professional jeweler (they will do this for free). Express your love to your partner by showing them how much you care and buy a matching pair. It was perfect!! Came in time! Runs a little small. Recommend going up a 1/4 size. Great quality for the price and fast shipping.